Menu Bar: Use pull-down menus from this menu bar to navigate or perform actions within a form. Window title: It is the text in the title bar that indicates the name of the window and usually gives context information pertinent to the information in that window. MDI window: It is a master container window that houses all windows, toolbars, and application windows. Tool tip: It is an iconic bubble help that you can use to determine the function of a button on the toolbar. Record or row: It is a set of one or more related data items from a table or view that are grouped for processing. Check box: It is a box in which you can toggle between an “on/off” or “yes/no” state for a particular value. LOV icon: It is an icon that you can click to display a list of values (LOV) for the current field. 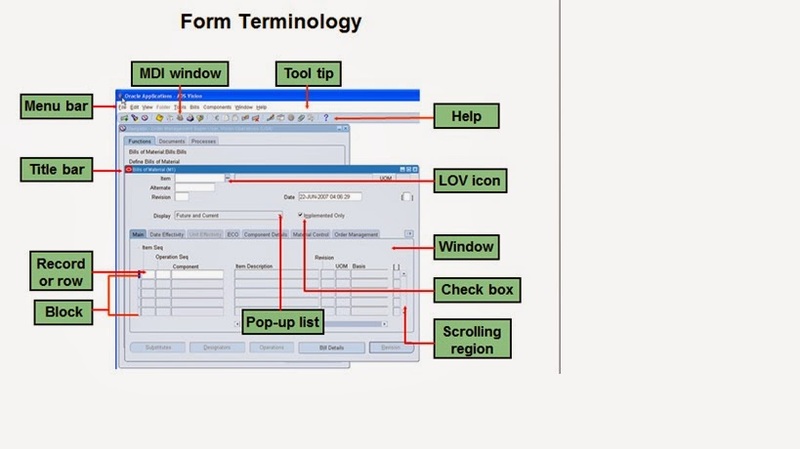 Pop-up list: A pop-up list lets you select a single value from a short list. Scrolling region: It is a region containing a scroll bar, in which to view other fields. Block: It is an area of information relative to a specific business function or entity.